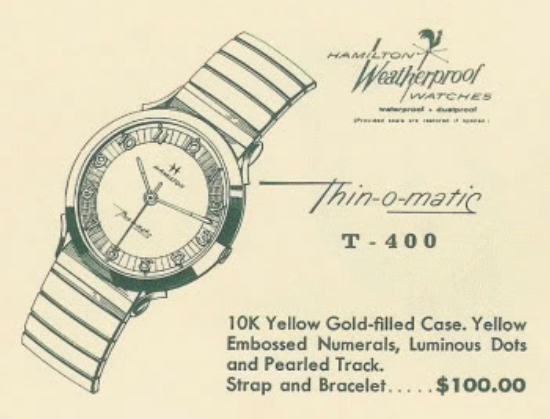 The first of the gold filled Thin-o-matics was the T-400. You can tell that from the model name, although there was also a T-401, T-402 and the T-450 introduced in the same year - 1959. But the honor of being first goes to the T-400 since it has the lowest number. It was produced for four years. 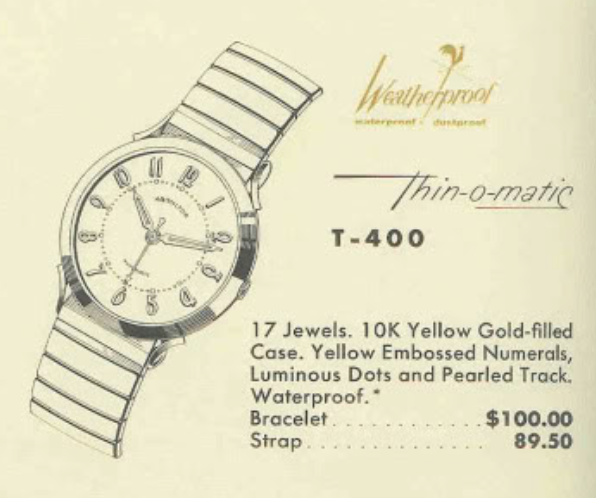 The T-400 is an interesting model because the dial was changed in 1961 to a slightly different layout and different hands too. The original pattern is sometimes called an exploding dial because the numerals are all oriented toward the center of the dial. In 1961 the numerals were all oriented vertically. There also appears to be a minute track and luminous dots on the outside perimeter. The original dial has a pearled track inside the numerals. In 1962 the hands were changed back to the original design, including the short arrow-tipped second hand. It looks a little out of place in the catalog image, in my opinion. The price dropped a little in 1962 as well. In addition, a masonic dial was also available. So there is a lot more complexity to a T-400 then you would originally suppose. I'm not entirely sure what movement you will find inside the T-400, other than a Buren-produced micro rotor. My project watch has a grade 666 but you might also find a 663 or even a 620, as they are all virtually identical. I believe the T-400 is a popular model because up until recently I had never been able to land a project watch at a low-enough purchase price. I was able to snag one finally, probably because it wasn't running and it has a faint radium burn on the dial from the hands being stuck in the same position for many years. As you would assume, the Thin-o-matic T-400 is very thin and has an almost flat case back. The crystal is very low profile too. The case back is unremarkable but it will shine up nicely after it's polished a little. The 666 movement literally fills the case. Everything is compactly fitted together with just enough room for all the parts to do their thing and not run into each other. It's an impressive design, considering this movement was produced 30 years before the advent of things like computer aided design (CAD) systems. While everything is being cleaned I'll get out a low-profile PK style crystal in 30.1mm. This low profile crystal will usually work on models with sub-second hands but sweep second models usually require more of a dome. If this doesn't work I will switch to a higher profile PHD style. Everything is cleaned and dried. I removed the radium in my cleaning solution so the dial and hands can be relumed with modern luminous paint. Now I just need to put it all back together. I always breathe a sigh of relief when the balance starts to swing after being reinstalled. I still need to install the balance jewels in the Inca shock setting. Then it will go onto the timer. It's running just a tad fast but that's easy to adjust. A slight tweak to the regulator brings the two lines a little closer to horizontal. I'll leave it running about 20 seconds fast for now, as it will need to settle down before any final adjustment is made. I had to switch to the PHD crystal as a PK was too low but you can't even tell there is a crystal at all in the finished project. New lume on the dial and hands gives everything a crisp look and I really love the complement made by the thin genuine ostrich strap. This is a really sharp looking watch, I can see why it is so desirable. I really like this model. I bought one myself earlier in the year. watches with radiating numbers like this are one of my favorites and not many Hamiltons have that. actually, the only other one from this era that I can think of that does that is the sea-lectric i.